A murder in wartime Switzerland reveals Swiss complicity with the Nazis in World War II, and US Army detective Billy Boyle is called to investigate. Europe, 1944: Captain Billy Boyle and his friend Lieutenant Piotr “Kaz” Kazimierz are sent to neutral Switzerland to work with the Office of Strategic Services (OSS), investigating Swiss banks that are laundering looted Nazi gold. The US and Swiss governments are about to embark on diplomatic discussions regarding the Safehaven Protocols, aimed at limiting the amount of war materials exported by Switzerland to the Nazis, stemming the tide of looted gold, and preventing postwar use of Nazi wealth by war criminals. With the talks about to begin and the Gestapo ever present, the OSS wants Billy and Kaz to protect the participants, which turns out to be a very deadly task. The plans go wrong from the beginning when Billy and Kaz crashland in France. As they make their way through occupied territory to the border, they meet Anton Lasho, a member of the Sinti ethnic group, whose family was slaughtered by the Nazis, and who is, in turn, a one-man Nazi-killing machine. They’ll need his help, because as they find once they make it across the border, Swiss banks are openly laundering gold “harvested” from concentration camps, and those who are profiting will do everything they can to protect their wealth and hide their dark secrets. James R. Benn is the author of the Billy Boyle World War II mysteries. The debut, Billy Boyle, was named one of five top mysteries of 2006 by Book Sense and was a Dilys Award nominee. A Blind Goddess was longlisted for the IMPAC Dublin Literary Award, and The Rest Is Silence was a Barry Award nominee. Benn, a former librarian, splits his time between the Gulf Coast of Florida and Connecticut with his wife Deborah Mandel. ​"Suspenseful ​. . . ​Benn does his usual excellent job of incorporating historical background into a fast-paced plot, which barely slows down on the way to the satisfactory resolution.​"
"Benn's 12th World War II mystery keeps the action coming, with a nifty whodunit chaser." ​"Benn​ ​molds an entertaining story out of Billy and his cohorts’ encounters with odious Swiss bankers and a cadre​ of ​Gestapo agents stationed in Bern to protect the loot. Great history here." "Extensive historical and military contextual detail, copious suspense, plenty of action, and the innate politics of power are distinctive traits of this acclaimed World War II–set series. Absorbing . . . Should appeal to historical fiction fans, mystery readers, and military buffs." "A white-knuckle adventure from the start. . . 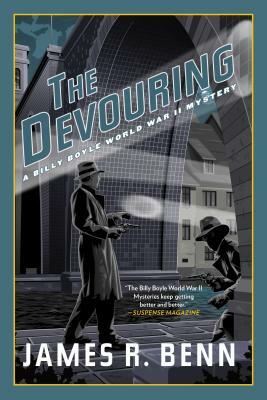 In The Devouring, Benn has created yet another thoroughly entertaining historical mystery page-turner that is filled with bountiful amounts of action and adventure. His ability to bring fresh understanding to an already well written about period of history is refreshing." "Thrilling . . . James Benn is a master of mystery novels. Benn has done another masterful job of maintaining the suspense and fast-paced action at Mach speed right up to last edge-of-your-seat moment." "Part whodunit, part MacGuffin, part spy novel and a beautifully and poignantly written war story, The Devouring is a multi-layered and artfully synthesized novel." "Cleverly told . . . the book weaves fascinating military facts with obscure historical details about the islands and native life." "One of Mr. Benn's best books of the series . . . A pleasure to read." "[An] excellent eighth Billy Boyle whodunit . . . The superior plot and thoughtful presentation of institutional racism directed against American soldiers about to risk their lives for their country make this one of Benn’s best." "These creations just keep getting better and better."